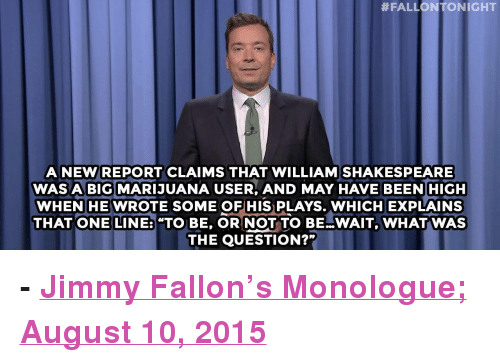 According to a comedic sketch from Jimmy Fallon, a “new report claims that William Shakespeare was a big marijuana user and may have been high when he wrote some of his plays . . . which explains that one line: ‘To be, or not to be… Wait. What was the question?’” If you’re a fan of late night comedy television, the odds are that you have heard plenty of jokes revolving around the debate about medical and recreational marijuana use in the United States. However, there is one aspect of this debate that really is no joke: marijuana-related investments. According to the U.S. Securities and Exchange Commission (SEC), there has been in an increase in the number of investor complaints regarding marijuana-related investments. Specifically, investors have been lured into investing in marijuana-related companies with the promise of extremely high returns only to have their entire investments disappear. The SEC warns investors that “fraudsters often exploit the latest innovation, technology, product, or growth industry [like marijuana]” to bait investors into fraudulent or dangerous investments. In the area of marijuana-related investments, it is important for investors to remember that marijuana is still illegal under the federal Controlled Substances Act, and that marijuana-related companies may be at risk of federal, and maybe state, criminal prosecution. According to the SEC, the U.S. Department of Treasury recently issued guidance stating: “The Controlled Substances Act makes it illegal under federal law to manufacture, distribute, or dispense marijuana [and] . . . [m]any states impose and enforce similar prohibitions.” Despite this law, marijuana-related investments may still be sold in unregistered offerings such as microcap stocks or penny stocks, both of which can be extremely risky for investors. Because these offerings are unregistered, investors may have limited information about the company’s management, services, and even finances. When information like this is scarce or difficult to find, fraudsters can easily spread fake news and information about a company, which can create HUGE profits for them while causing investors to lose all of their investment capital. So, how can you avoid being baked by these types of investments? Well, the SEC recommends that you start by ensuring that you understand the marijuana-related company’s business and its services. You should start by carefully reviewing all of the materials that you are given and verify the truth and accuracy of everything you are told about the investment. In addition, you should also pay attention to the company’s financial statements, especially if they are not audited by a certified public accountant. You should also check with the SEC to see whether or not the agency has taken any action against the company or anyone associated with the company. While marijuana-related companies seem to be the bud of almost every joke on television, remember that investing in these companies can be extremely risky and can cause you a lot of remorse. If you’re considering these types of investment, be sure to take extra precautions and consult an investment professional before you get started.